Emerald Ridge Elementary School - Construction began on this brand new state-of-the-art school in fall 2012 and was ready for students by the first day of school in September 2014. Some of the school’s unique features are the areas of instruction grouped by age and grade, the project room and the flexibility of the core area of the school, which includes the main entrance area, the gym and the performing arts area. Lumsden Elementary School Addition - Construction began in January 2013 with project completion by September 2014. The upgraded facility is home to a new 51 space licensed child care centre, a larger gym and new gym services area, a performing arts centre, an expanded science lab, and a learning street that serves as a gathering place for students. Education Centre Expansion and Renovation - The project accommodates all central functions in Prairie Valley School Division, including a Professional Development Centre, a professional library, secure information technology server space, central shipping and receiving, and safe, efficient workspace for staff. Kipling School Consolidation and Modernization - Construction began in late August 2011 and was completed in fall 2013. The school has a new and renovated elementary classroom wing, which allowed closure of the old primary building across the street from the main school. It also has a new servery, administrative offices, and band/arts/multi-purpose space. Health and safety upgrades were also completed. Vibank School Modernization - Construction began in June 2011 and was completed in fall 2013. 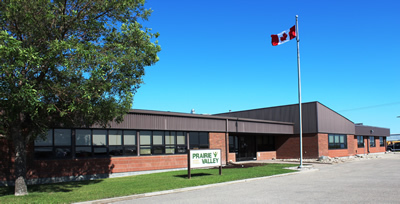 Change rooms were upgraded, a new library and a single storey elementary classroom wing were added library, administrative offices were relocated and the high school wing was renovated. Health and safety upgrades were also completed. Balcarres Community School Consolidation and Modernization - In fall 2013, a new main entrance, administration office, servery and cultural room were completed as part of the final phase of a four phase project which started in 2006 as a result of the closure of the old primary building due to health and safety concerns. In addition, six sections of roof were repaired, duct work was replaced and an accessible washroom was added.